P.M.: Upon arrival at Ouagadougou airport, you will be met, assisted and transferred to your hotel. Overnight at Hotel. A.M.: Ouagadougou city Tour: the national museum, the market, the craft village etc. Lunch in town. 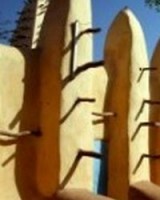 P.M.: Visit a Mossi village, dinner and overnight in Ouagadougou. Day 3: Ouagadougou – Bobo. A.M.: Breakfast then drive to the second biggest city, sightseeing many villages. P.M: Upon arrival in Bobo, dinner and overnight there. Day 4: Bobo - Dioulasso. A.M.: Breakfast, tour of Bobo city: the museum, the market, the old district of Bobo etc. Lunch in Bobo. P.M.: Drive to visit the hippopotamus pool toward Banfora, drive back to Bobo late in the afternoon. Day 5: Bobo – Mopti. A.M.: Depart to cross the border of Mali and reach Mopti, the venice of Mali, sightseeing and lunch en route. P.M.: Upon arrival in mopti check into your hotel and stay overnight there. Day 6: Mopti – Timbuktu. A.M.: Early in the morning depart to Timbuktu via Douentzan, lunch en route. P.M.: Arrive Timbuktu and then visit the city: the mosque the old city, the explorers houses, the manuscripts etc. Lunch in Timbuktu. Camel ride to visit Tuareg camp. Dinner and overnight in Timbuktu. Day 7: Timbuktu – Mopti. A.M: Breakfast, drive back to Mopti; lunch en route. P.M.: Upon arrival in Mopti check into your hotel and overnight there. Day 8: Mopti - Kona Mopti. A.M.: Cruise in a traditional motorized pirogue named pinasse to Konna, a Fulani village located at 55 km from Mopti. This highlight will enable you to visit Fulani, Songhaï, bozo villages on the river shore. Have lunch in the pinasse. P.M.: Once arrived in Konna, we are met by our driver and drive to Mopti, dinner and overnight in Mopti. A.M.: Breakfast then Mopti city tour: the big mosque, the bustling market, the fishing port where pirogues are made etc… P.M.: After lunch in Mopti drive to the fascinating Dogon country, stop in Songho, a Dogon village, reknown for its rock paintings and circumcision grotto. Dinner and overnight in Sangha. Day 10: Dogon country – Djenné. A.M.: This morning, we travel to Djenné, Mali architectural city; lunch in Sévaré. P.M.: Upon arrival you will discover this city: the big mosque, the coranic schools etc, dinner and overnight in Djenné. Day 11: Djenné – Ségou. A.M.: Breakfast then visit Djenné on its weekly market day, have lunch in Djenné or stop and have lunch when driving Ségou via San. P.M.: Upon arrival in Ségou, check into your hotel dinner and stay overnight there. Day 12: Ségou – Bamako. A.M.: Ségou city tour: the local brewery, the colonial Soudanese style houses, the old district of Ségou named Sekoro. Dinner and overnight in Bamako. Day 13: Bamako – Kita. A.M.: Breakfast then Bamako city tour: the national museum the craft center, the overview from Point G, the market. P.M.: After lunch drive to Kita, Malinké ethnic group city located at 120 Km from Bamako. Dinner and overnight in Kita. Day 14: Kita – Kaye. A.M.: Depart in the morning to Kayes, lunch en route. P.M.: Upon arrival, check into your hotel and overnight in your hotel. A.M.: Kayes city tour: the colonial buildings, the market…have lunch in town. P.M.: Drive to visit the waterfall of Felou, back to Kayes dinner and overnight in Kayes. Day 16: Kaye – Matan. A.M.: This morning you will be heading for Senegal, have lunch en route. P.M.: Upon arrival in Matan, a Senegalese city, check into your hotel and stay there overnight. Day 17: Matan - Saint Louis. A.M.: Breakfast then drive to Saint Louis, have a picnic lunch en route. P.M.: Upon arrival in Saint Louis, installation, dinner and overnight in your hotel. Day 18: Saint Louis – Dakar. A.M.: Breakfast then tour of the city and drive to Dakar; have lunch en route heading for Dakar. P.M.: Upon arrival, check into your hotel and stay overnight in your hotel. Day 19: Dakar – Gorée – Dakar. A.M.: Depart in the morning to Island of Gorée where slaves were regroupped and embarked to America. P.M.: Have lunch on this place and then return to dinner and stay overnight in Dakar. A.M.: Breakfast then tour of Dakar city: the museum, the market.